Autumn tundra landscape in Norway, Europe. Photo © Paul Oomen / Getty Images. The tundra is a terrestrial biome that is characterized by extreme cold, low biological diversity, long winters, brief growing seasons, and limited drainage. The harsh climate of the tundra imposes such formidable conditions on life that only the hardiest plants and animals can survive in this environment. The vegetation that grows on the tundra is restricted to a low diversity of small, ground-hugging plants that are well-adapted to survive in nutrient-poor soils. The animals that inhabit the tundra are, in most cases, migratory—they visit the tundra during the growing season to breed but then retreat to warmer, more southern latitudes or lower elevations when temperatures drop. Tundra habitat occurs in regions of the world that are both very cold and very dry. In the Northern Hemisphere, the Arctic lies between the North Pole and the boreal forest. In the Southern Hemisphere, the Antarctic tundra occurs on the Antarctic peninsula and on the remote islands that lie off the coast of Antarctica (such as the South Shetland Islands and the South Orkney Islands). 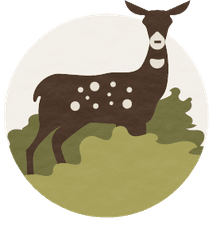 Outside of the polar regions, there is another type of tundra—alpine tundra—which occurs at at high altitudes on mountains, above the treeline. The soils that blanket the tundra are mineral-deprived and nutrient-poor. Animal droppings and dead organic matter provide the bulk of what nourishment is present in tundra soil. The growing season is so brief that only the topmost layer of soil thaws during the warm months. Any soils below a few inches deep remain permanently frozen, creating a layer of earth known as permafrost. This permafrost layer forms a water-barrier that prevents drainage of meltwater. During the summer, any water that thaws in the upper layers of the soil is trapped, forming a patchwork of lakes and marshes across the tundra. 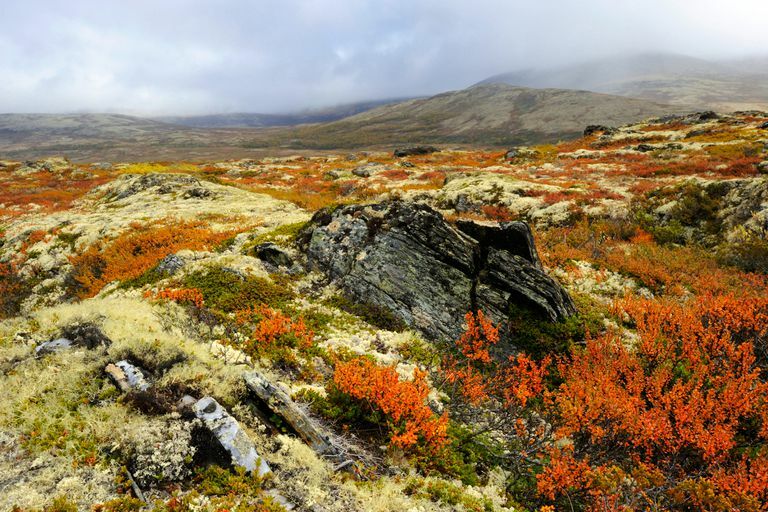 Tundra habitats are vulnerable to the effects of climate change and scientists fear that as global temperatures rise, tundra habitats might play a role in accelerating the rise in atmospheric carbon. Tundra habitats are traditionally carbon sinks—places that store more carbon than they release. As global temperatures rise, tundra habitats may shift from storing carbon to releasing it in massive volumes. During the summer growing season, tundra plants grow quickly and, in doing so, they absorb carbon dioxide from the atmosphere. The carbon remains trapped because when the growing season ends, the plant material freezes before it can decay and release the carbon back into the environment. As temperatures rise and areas of permafrost thaw, the tundra releases the carbon it has stored for millennia back into the atmosphere. Arctic and Antarctic tundra - Arctic tundra is located in the Northern Hemisphere between the North Pole and the boreal forest. Antarctic tundra is located in the Southern Hemisphere on remote islands off the coast of Antarctica—such as the South Shetland Islands and the South Orkney Islands—and on the Antarctic peninsula. Arctic and Antarctic tundra supports about 1,700 species of plants including mosses, lichens, sedges, shrubs, and grasses. Alpine tundra - Alpine tundra is a high-altitude habitat that occurs on mountains around the world. Alpine tundra occurs at elevations that lie above the tree line. Alpine tundra soils differ from the tundra soils in polar regions in that they are usually well-drained. Alpine tundra supports tussock grasses, heaths, small shrubs, and dwarf trees. Northern bog lemming (Synaptomys borealis) - The northern bog lemming is a small rodent that inhabits the tundra, bogs, and boreal forests of northern Canada and Alaska. Northern bog lemmings eat a variety of plants including grasses, mosses, and sedges. They also feed on some invertebrates such as snails and slugs. Northern bog lemmings are prey for owls, hawks, and mustelids. Arctic fox (Vulpes lagopus) - The arctic fox is a carnivore that inhabits the Arctic tundra. Arctic foxes feed on a variety of prey animals that includes lemmings, voles, birds, and fish. Arctic foxes have a number of adaptations to deal with the cold temperatures they must endure—including long, thick fur and an insulating layer of body fat. Wolverine (Gulo golo) - The wolverine is a large mustelid that lives in boreal forest, alpine tundra, and Arctic tundra habitats throughout the Northern Hemisphere. Wolverines are powerful predators that feed on many different mammal prey including rabbits, voles, lemmings, caribou, deer, moose, and elk. Polar bear (Ursus maritimus) - The polar bear inhabits the icecaps and Arctic tundra habitats in the Northern Hemisphere including areas of Russia, Alaska, Canada, Greenland and the Svalbard Archipelago. Polar bears are large carnivores that feed primarily on ringed seas and bearded seals. Muskox (Ovibos moschatus) - The muskox is large hoofed mammals that live in the Arctic tundra. Muskoxen have a sturdy, bison-like appearance, short legs and long, thick fur. Muskoxen are herbivores that feed on grasses, shrubs and woody vegetation. They also eat moss and lichens. Snow buntings (Plectrophenax nivalis) - The snow bunting is a perching bird that breeds in the Arctic tundra and in some areas of alpine tundra such as the Cairngorms in Scotland and the Cape Breton Highlands in Nova Scotia. Snow buntings migrate south during the winter months to escape the tundra's coldest temperatures. Arctic tern (Sterna paradisaea) - The Arctic tern is a shorebird that breeds in the Arctic tundra and migrates 12,000 miles to over-winter along the coast of Antarctica. Arctic terns feed on fish and invertebrates such as crabs, krill, mollusks, and marine worms.